Our 54th Season opens with the distinguished cellist Natalie Clein, accompanied by Ekaterina Apekisheva, in a recital to be held in St Peter’s Church. Natalie’s exceptional musicianship has earned her prestigious prizes and universal respect. She won the BBC Young Musician of the Year in 1994 when she was just 16, and she performed for the Berkhamsted Music Society in the 1995/6 season. 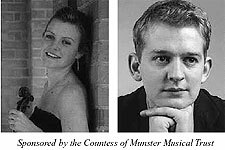 She was awarded the Queen Elizabeth the Queen Mother Scholarship by the Royal College of Music before completing her studies with Heinrich Schiff in Vienna. Her concerto debut was at the Proms in 1997. Since that time she has performed with most UK orchestras. Equally at home in chamber music, she has regularly performed with the Belcea, Jerusalem and Takacs quartets and the Nash Ensemble. She plays on the ‘Simpson’ Guadagnini cello of 1777. Her accompanist, Ekaterina Apekisheva, is equally distinguished in her home country, Russia, where she was born into a family of musicians and started to play the piano at the age of five. At six she entered the famous Gnessin School of Music, continuing her studies at the Rubin Academy of Music in Jerusalem. She moved to London in 1994 to study at the Royal College of Music. She has performed widely on the Continent, the US and Far East. Nikolai Demidenko, a great international name, gives our October concert. Studying at the Moscow conservatoire, a medallist at the Montreal and Tchaikovsky international competitions, he then made his British debut in 1985. Since 1990 he has been resident in the UK, and was granted British citizenship in 1995. There is scarcely a city where his outstanding talents have not been acclaimed and praised, whilst his performances are available on CD on Hyperion, ASV Gold and other labels. Mozart - Quartet in B flat K458 "Hunt"
The November concert features two familiar names - the Martinu Quartet and Angus Meryon in a superb concert featuring Mozart and Dvorak Quartets and Angus in the lovable Brahms Clarinet Quintet. The Martinu Quartet first came together in 1976 at the Conservatoire in Prague and later took part in masterclasses with leading ensembles such as Amadeus, Juilliard and Alban Berg Quartets. 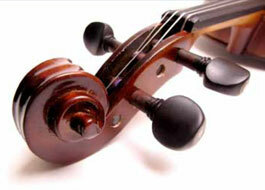 They have performed in most European countries and in North America and Japan. Angus Meryon was born in 1975 and studied clarinet from the age of seven. He continued his studies at the Royal College of Music andhis concerto performances include the Weber, Copland and Mozart concertos. His solo London debut was at the Purcell Room in 2002. He performs regularly with the Martinu Quartet during their UK tours. The Christmas treat this year will be provided by the Clerks’ Group. Their recordings and performances of Renaissance vocal music has earned the group a place among the foremost interpreters of the repertoire. They have released over 20 CDs, including a rosette in the 2005/6 Penguin Good CD Guide. A number of composers have written works especially for the group. The group’s founder and director is Edward Wickham, Director of Music and a fellow at St Catherine’s College, Cambridge. The first half of the concert will include early music for advent and the second half, carols from the middle ages to the present. awarded a Foundation scholarship to study music at the Royal College under Yossi Zivoni, where she graduated in 2005 with first class honours. She has already performed in venues across the UK. She works with her award-winning duo partner, Alasdair Beatson. Scottish born, he was a Foundation scholar at the Royal College of Music and graduated with a first class honours Bachelor’s degree in 2002. Based now in London, he is much sought after as recitalist, orchestral soloist and chamber musician. He will perform a solo piece at the Ellie Fagg concert in February 2008. Our last concert of the season is by pianist Llyr Williams, who brings extraordinary musical intelligence to all he undertakes. He made his 2005 Proms debut with the BBC Symphony Orchestra, and appeared with the Academy of St Martin-in-the-Fields at the Barbican’s Mostly Mozart festival. He returned to the Edinburgh International Festival last year for the fourth time and gave an extraordinary and memorable performance of Beethoven’s Hammerklavier Sonata, also appearing with the Minnesota Orchestra under Osmo Vanska. Born in 1976 in North Wales, he read music at Queen’s College, Oxford, graduating in 1998 with a first class alpha degree. He went on to study under a postgraduate scholarship at the Royal Academy, where he won every prize and award.